Access to the Internet is one of the key services provided by today’s public libraries, as evidenced by the lines of patrons that often form to sign up for public access computers. What do all of those patrons do when they’re not online? In Jefferson County it seems that they’re using other library resources. Based on a snapshot of computer and circulation usage data collected during a randomly selected week in April 2007, Jefferson County Public Library (JCPL) patrons who signed into the library’s Internet and software computers checked out more books, on average, than patrons who did not use the library’s computers. 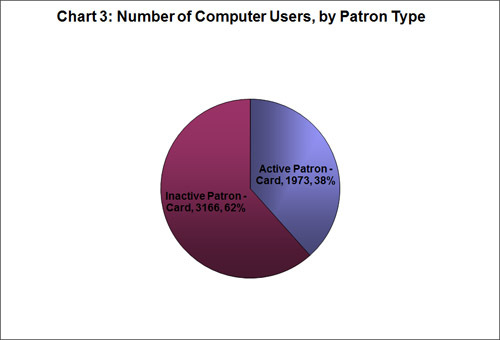 Among “active borrowers,”1 patrons who used library computers had an average of 6.0 items checked out to their library cards at the time of the snapshot. 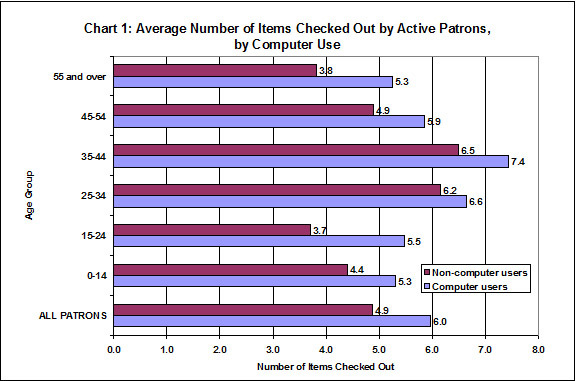 For non-computer users, the average of items checked out was 4.9 per patron. Thus, circulation for library computer users was over 22 percent higher than circulation for patrons who did not use the library’s computers. This trend of library computer users checking out more materials was apparent among all age groups, and was most pronounced with patrons between 15- and 24-years-old (see Chart 1). Circulation for this group was more than 48 percent higher for library computer users than for their peers who did not use the computers. The increased use of both materials and computers is not lost on the library’s administration. “Day to day, we’ve noticed increases in patrons using our computers as well as increases in our circulation counts. It’s really great to see that these uses are linked and not totally independent of each other,” says Marcellus Turner, Executive Director of Jefferson County Public Library. In public libraries throughout the nation, emphasis is placed on making the library a welcoming place for teenagers and young adults. 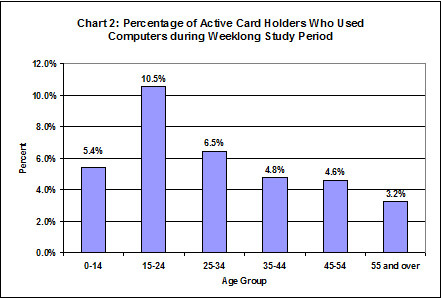 At JCPL, the same age group (15-24) proved to be the most likely active borrowers to use the library’s computers, as over 10% of active cardholders in this age range had used a library computer at least once during the week of the study (see Chart 2). Seemingly, information-savvy young adults are making the most of the opportunities JCPL is providing. There has been much discussion in the library profession revolving around whether library computers are drawing in users who then use other library resources. 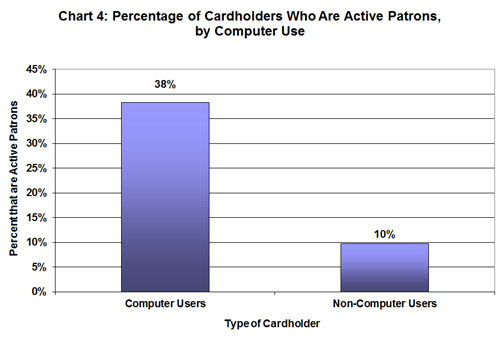 Of the library patrons who logged in to Jefferson County Public Library’s computers during the week of this study, a majority of them (62%) were not active borrowers (see Chart 3). 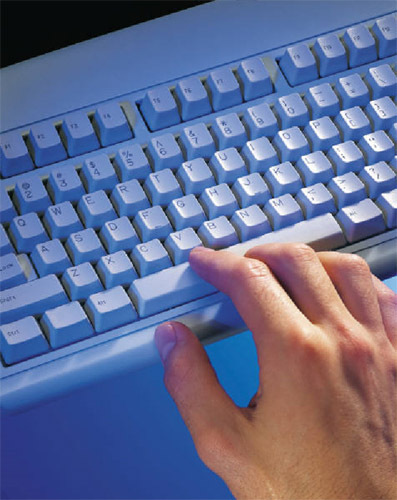 This means that nearly two-thirds of the patrons using JCPL’s computers had not otherwise accessed their library account in the previous 2 months. 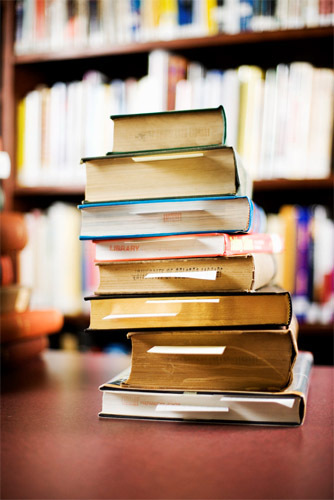 It is quite probable that many of these patrons used other library resources during the previous 2 months—there are many things that can be done in the library that do not require checking out materials. For instance, patrons can perform genealogical research, use government documents, ask reference questions, or attend programs without accessing their circulation records. The nature of this study, based on available data, meant that such non-circulation activities were not tracked. It is not known whether these patrons did any of the above, but it is known that they used the library’s computers and did not have any circulation activity. For this group it would seem that a primary reason to visit the library was to access the Internet or use other software. For them, the library is providing this increasingly valuable service and helping to minimize the digital divide. At first glance, it may seem striking that only 38 percent of computer users are active borrowers. Barely a third of the patrons clicking away are taking traditional library materials home with them. However, this is actually a quite positive number. Only 10 percent of JCPL cardholders who did not use the library computers during the study week were deemed “active” for the purpose of this study. Those who used the library’s computers during the study were over 3 times more likely to have an active card than those not using the computers. This suggests that people are coming in for the computers, and taking advantage of other resources as well (see Chart 4). Jefferson County Public Library consists of 10 libraries that serve the 534,000 residents of Jefferson County, Colorado. Jefferson County is a large suburban county, extending from the western edge of Denver into the Rocky Mountain Foothills.